Written with wit and passion, Paul A. Offit's often humorous guide to taking on quack experts and self-appointed activists is a must-listen for any American disturbed by the uptick in politicized attacks on science. Science doesn't speak for itself. Neck-deep in work that can be messy and confounding and naïve in the ways of public communication, scientists are often unable to package their insights into the neat narratives that the public requires. Enter celebrities, advocates, lobbyists, and the funders behind them, who take advantage of scientists' reluctance to provide easy answers, flooding the media with misleading or incorrect claims about health risks. Amid this onslaught of spurious information, Americans are more confused than ever about what's good for them and what isn't. 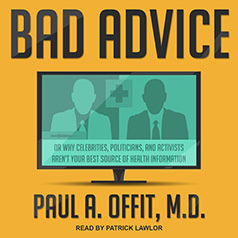 In Bad Advice, Paul A. Offit shares hard-earned wisdom on the dos and don'ts of battling misinformation. For the past twenty years, Offit has been on the front lines in the fight for sound science and public heath. Stepping into the media spotlight as few scientists have done—such as being one of the first to speak out against conspiracy theories linking vaccines to autism—he found himself in the crosshairs of powerful groups intent on promoting pseudoscience. Bad Advice discusses science and its adversaries: not just the manias stoked by slick charlatans and their miracle cures but also corrosive, dangerous ideologies such as Holocaust and climate-change denial.